Want to take total control of recorded TiVo shows? Feel like to have your Android slab/handset stay in touch with your TiVo DVR? Do not bother trying sorts of TiVo hacking methods, there is easier way to go! This article introduces you the fastest way transferring TiVo recordings to your Android device so that your favorite TV shows won't be restricted in your house. TiVo Desktop is a free tool that lets you publish and share digital music, photos and TiVo recordings between your networked TiVo Series DVR/HD-DVR and your computer. Get TiVo Desktop and to transfer shows from your TiVo to PC. 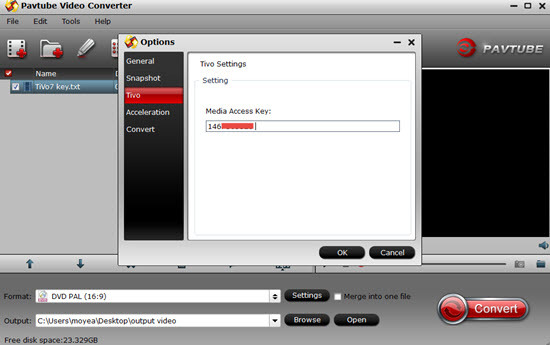 Pavtube Video Converter is an easy-to-use TiVo decoder, which does not hack TiVo box, but instead, convert .tivo files to desired format on computer. This TiVo Converter not only restore protected TiVo shows to MPEG format for fair use, but also features preset MP4 formats for you to converts TiVo to versatile Android tablets optimized videos that plays best image. Press "Option" button. Switch to "TiVo" tab in Option window, and enter TiVo Media Access Key. How to find your Media Access Key on TiVo: Go to "TiVo Central"> "Messages and Set Up" "Account and System Information", and your Media Access Key would be there. Step 2. Drag and drop TiVo shows to the main interface for converting TiVo to MP4. The preset will downsize a TiVo file to less than 4GB so as to meet the FAT32 file system that used on Android devices. After conversion completes you can click "Open" to find converted and copy TV shows to your Android tablet or smartphone for carrying along with. 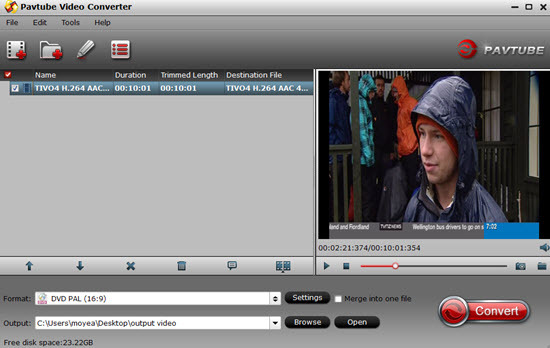 How to convert TiVo HD recordings to MP4 on Mac? How to convert TiVo shows to MPEG with TiVo to MPEG Converter for Mac?